Elemental savants study the basic building blocks of existence—air, earth, fire, and water—learning to harness their powers. Eventually they transcend their mortal forms and become elemental beings. Elemental savants often begin their careers as individuals intrigued by one or all of the classic elements. Before they ever take levels in the prestige class, these spellcasters typically find themselves drawn to spells of a particular energy type. These spellcasters fi nd satisfaction in the unleashed purity of the elemental energy forms, and they become elemental savants to grow closer to the element that becomes their favorite. To qualify to become an Elemental Savant a character must fulfill all the following criteria. Spells: Spells: Able to cast at least three spells that have one of he following descriptors in common: acid, cold, electricity, or fire. One of the spells must be at least 3rd level. Special: Special: Must have made peaceful contact with an elemental or outsider that has an elemental subtype (air, earth, fire, or water). The elemental savant’s class skills (and the key ability for each skill) are Concentration (Con), Craft (Int), Knowledge (arcana) (Int), Knowledge (the planes) (Int), Profession (Wis), and Spellcraft (Int). Spells per Day/Spells Known: At each level except 5th and 10th, an elemental savant gains new spells per day (and spells known, if applicable) as if she had also gained a level in a spellcasting class to which she belonged before adding the prestige class level. She does not, however, gain any other benefit a character of that class would have gained (improved chance of turning or destroying undead, a bonus feat, and so on). If she had more than one spellcasting class before becoming an elemental savant, she must decide to which class to add each level for the purpose of determining spells per day and spells known. Immunity to Sleep (Ex): At 2nd level, as an elemental savant continues to transcend her mortal form, she gains immunity to sleep effects. Energy Penetration (Ex): Beginning at 3rd level, an elemental savant further refi nes her ability to wield energy associated with her chosen element. When she casts a spell using that type of energy, she gains a +2 competence bonus on caster level checks (1d20 + caster level) to overcome a creature’s spell resistance. At 8th level, this bonus increases to +4. These bonuses stack with those granted by the Spell Penetration and Greater Spell Penetration feats. Energy Focus (Ex): From 5th level on, an elemental savant is better able to manipulate energy associated with her chosen element. The save DC for any spell with that energy descriptor increases by 1. At 10th level, these save DCs increase by 1 again (total increase of 2). These increases are cumulative with those granted by the Spell Focus and Greater Spell Focus feats. Darkvision (Ex): At 6th level, an elemental savant gains darkvision out to 60 feet. Immunity to Paralysis and Poison (Ex): As an elemental savant approaches elemental perfection, she gains immunity to paralysis and poison at 9th level. Elemental Perfection: At 10th level, an elemental savant, through long association with elemental entities and extensive study of their secrets, completely transcends her mortal form to become an elemental creature. Her type changes to elemental. She no longer needs to eat, sleep, or breathe (though she must still rest to regain spells). She gains an elemental creature’s immunity to stunning, and she is no longer subject to extra damage from critical hits or fl anking. An elemental savant gains the speed and movement modes, natural attacks, special attacks, and special qualities of a Medium elemental of the type appropriate to her elemental specialty, as noted in the Monster Manual, except that the save DC against her elemental attack form, if any (whirlwind, burn, or vortex) is 20 + her Con modifier. Upon achieving this state, an elemental savant’s appearance undergoes a minor physical change, usually to the skin or eyes. An earth elemental savant, for example, might acquire gemlike eyes and hard, pebbly skin. Anyone who shares the elemental savant’s predilection for study of her chosen plane immediately recognizes her transcendent nature. 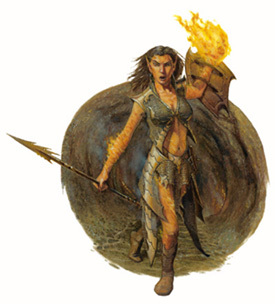 She gains a +2 circumstance bonus on all Charisma-based skill and ability checks when interacting with creatures that share her elemental subtype (air, earth, fire, or water) and with other elemental savants who have chosen her element. Unlike a normal elemental, an elemental savant retains a soul separate from her body. She can be raised from the dead as normal for a creature of her previous type. Energy Immunity (Ex): From 10th level on, an elemental savant gains immunity to the type of energy associated with her chosen element.